UHF Female to UHF Male LMR-240 Cable Assembly is Ideal for Jumper in Wireless Communications Systems needing Low Loss Communications 50ohm Coax Cable. This UHF Female to UHF Male Low Loss RF Cable uses Times Microwave LMR-240 has the lowest loss of any flexible cable and comparable loss to semirigid hard-line cables including LMR 240 vs RG8x. The UHF Female to UHF Male LMR-240 Cable Assembly is a custom coaxial assembly with RF Shielding is 50 dB greater than typical single shielded coax (40 dB). The multi-ply bonded foil outer conductor is rated conservatively at > 90 dB (i.e. >180 dB between two adjacent cables). UHFF-LMR240-UHFM-Length is custom made to your requirements. Enter your required cable length in the box. Any Additional cable length must be entered in Feet. Any additional footage will be added to the base price at 0.80cents per foot. Cable is 100% inspected before shipping. Please Enter any additional information for your cable you require. (connector dependent). The Field Components LMR 240 Cable Assemblies have an impedance of 50ohm. The UHFF-LMR240-UHFM-Length LMR 240 Cable Assemblies 50ohm is precision manufactured for the RF and Microwave components. LMR(R) Cable Assemblies are part of over 200,000 available RF and Microwave components available to order online. UHF Female Connector On LMR-240 To UHF Male Connector Cable Assembly products from Field Components can ship the worldwide. 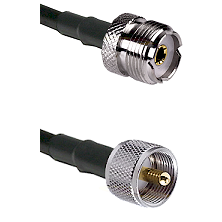 We will also custom build UHF Female coaxial cables and adapter that ship quickly for all your RF Component needs. Additional connector plating options upon request include: Gold Plated Stainless Steel, Passivated Stainless Steel, Olive Drab Plated Brass, White Bronze Plated Brass, Black Oxide/Chrome Plating and Tri-metal Albaloy/SUCO coating for LOW PIM applications. Call 888-413-4353 for your specific requirements. In Addition to our UHFF-LMR240-UHFM-Length LMR 240 Cable Assemblies Field Components stocks additional high frequency precision grade adapters, RF connectors and test grade RF Cable jumpers for wireless telecommunications applications, including WiFi, PCS, radio, computer networks, test instruments, Distribution Antenna Systems (DAS) and antenna devices.